ModNation Racers Multiplayer A "Rehashed Feature"
ModNation Racers won't have online multiplayer on PS Vita because the development team at SCE San Diego didn't want to "rehash features" from previous games in the series. "We really wanted to evolve online functionality and take advantage of the PlayStation Vita’s unique feature set in new ways. If all we ever did as developers is rehash features that have been done in previous games, we’d still be entering passwords instead of using save files and you’d have to start the entire game over after you lost your three lives (extra 1-ups aside)." Waas added that online multiplayer was so ubiquitous, that the team prioritised other ways to play instead. "While online head-to-head has been a mode used in many games in recent years, we focused on making a game that is crafted for how portable games are most often played—in quicker “pick up and play” sessions multiple times in a day." User comments on the PS Blog revealed a wave of negativity for dropping the online mode, with one user writing: "Seriously, head to head online play is now regarded as a rehash of old features? I’m sitting here shaking my head in disbelieve at probably the worst PR spin of 2012 and we are only halfway through January." ModNation Racers is set to launch with the PS Vita on 22 February in Europe. 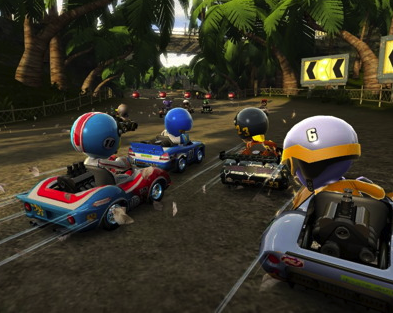 Will you be picking up ModNation Racers still? And what are your thoughts on multiplayer being a "rehashed feature"? Let us know in the comments below!